Growing pressure on global water resources is having major impacts on our social, economic, and environmental well-being. But despite growing recognition that the world’s water-related challenges extend beyond national and regional boundaries, there has been little-to-no discussion about global water governance that looks more holistically at shared water challenges. A new report from the Pacific Institute examines structures and approaches needed to meet the challenge of sustainable water management in an interconnected world. Water governance processes facilitate interaction and dialog among key players, both formal and informal, for setting standards and objectives and for resolving disputes over water resources. 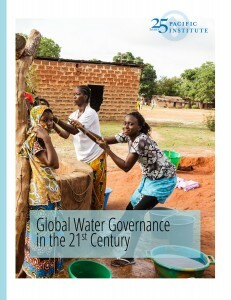 The report Global Water Governance in the 21st Century identifies major concerns and offers recommendations for how water governance can be improved. -Securing a sustainable funding source and a stronger mandate for intergovernmental organizations to promote greater collaboration among organizations engaged in water governance. -Adopting new standards, codes, and best practices for water resource development and management to promote greater transparency, participation, and accountability. -Promoting capacity building and increasing participation in water management for local, regional, and national government entities and civil society groups. -Developing financing mechanisms to support ongoing operation and maintenance costs of water-related infrastructure and the people and institutions needed to manage it effectively. -Improving the flexibility of existing inter-basin agreements in response to changing social, economic, and climatic conditions – and improving understanding and communication of risk and uncertainty. This work was initiated and supported by the United Arab Emirates Ministry of Foreign Affairs and the Abu Dhabi Future Energy Company PJSC – Masdar.